PHILADELPHIA (WPVI) -- The Walt Whitman Bridge will close to traffic for 20 minute intervals between the hours of 10 p.m. and 4 a.m. on Tuesday and Wednesday nights. 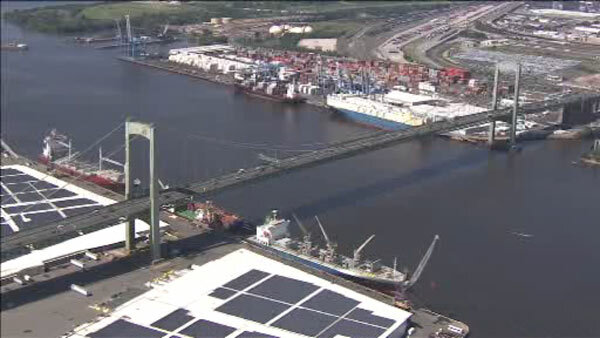 The Delaware River Port Authority says the periodic closures are necessary to allow construction crews to install a temporary roadway shield around the bridge's Pennsylvania tower. They say the shield will protect vehicles from overhead work during the bridge's ongoing $56 million painting project. Starting at 7 p.m. on closure nights, bridge traffic will be reduced to three lanes in each direction. After 10 p.m., the first 20-minute closure will occur and all traffic will be stopped. In between each closure, the bridge will reopen to allow stopped traffic to cross. Drivers are strongly advised to use the Ben Franklin Bridge or Commodore Barry Bridge during these times. The Port Authority says variable message signs across the region will advise drivers about the closures and delays. Morning rush hours will be unaffected. The Walt Whitman Bridge painting project began in 2016. The project consists of blast cleaning and painting the bridge suspension spans; interior and exterior of the towers, girders and diaphragms supporting the anchorage decks; and painting the main cables and suspender ropes. The work also includes performing structural repairs of various bridge components. The bridge was last painted in 1992. In addition to the painting project, the bridge recently received $7.7 million worth of improvements to its toll plaza, roadways and ramps.